The airport will be very busy. Plan for extra time. ATL suggests at least 2 hours for domestic and 3 hours for International. Due to construction there is no curb side baggage check. All shuttles are only able to drop off on the North side. If you are flying Delta you will need to walk through the terminal to check your bags. Make a reservation. 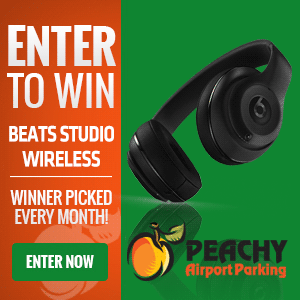 Go to peachyairportparking.com. During busy periods we are reservation only, be prepared to show your reservation at the gate. International travel. Our shuttles service the international terminal directly every 20 minutes on the hour, back and forth 24 hours per day from the indoor parking facility only. If you would like to park outdoor, you will need to take the ATL shuttle from the domestic terminal to the international terminal. Please allow an additional 20 to 30 minutes if you wish to do this. Take valuables with you or leave them at home. If you require wheel chair assistance, please indicate it on your reservation. You should also call the airline in advance to arrange transportation to the gate. Have your paperwork ready at check out. Keep the ticket you receive when you enter for exit. If you have a reservation or other paperwork you will need to show it at checkout to get the rate. Stay Peachy! Have a happy holiday!